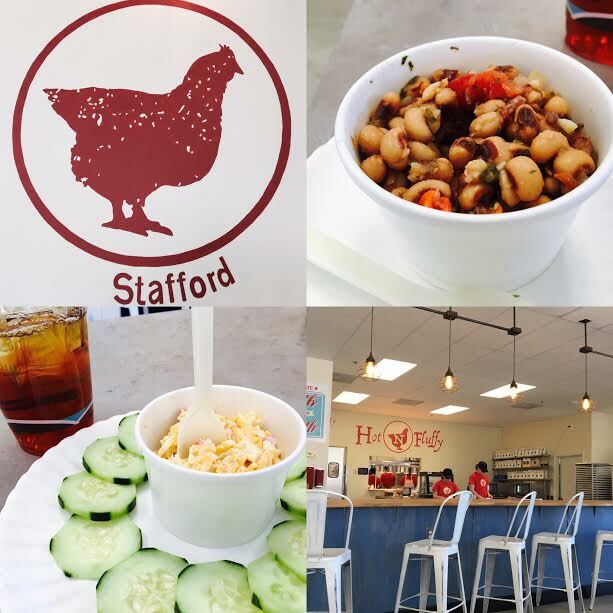 Last week a listing appointment brought me up to North Stafford, which was perfect timing because I've been excited to try Hot N Fluffy, a new biscuit based restaurant off 610. It seems biscuit joints are opening up right now at the same speed cupcake shops opened up about ten years ago. No complaints here. I love a good biscuit, plain or stuffed with goodness! Hot N Fluffy is located in a busy shopping center strip mall, however, once you enter, it becomes much easier on the eyes, with nice lines and comforting colors. Simple process: order at the counter, receive a number and your meal comes to you. Following your meal, you'll clear your own place. In the name of research I ordered several items. Sweet Tea, Pimento Cheese Dip, Black Eyed Pea Salad and a Biscuit. The Sweet Tea was spot on, just like it's supposed to be. The dip was the classic variety with a little extra kick of black pepper, and the pea salad was exactly like you'd find on a church potluck table, which means it was perfect. The biscuit was fresh and fluffy, just as advertised. The menu, which can be found on their website https://www.hotnfluffy.com/ contains Nibbles, Trimmings, Sweets, Biscuits, Biscuit Sandwiches, and a few Southern entrees. I had a chance to chat with the owner, she came over to offer a few to-go boxes. She said they have had a good welcoming into the North Stafford area and are looking forward to possibly expanding into the Fredericksburg area in the next year or so. Bring on the biscuits! Good to know, they must have updated their system since I was there a few weeks ago. Thank you!